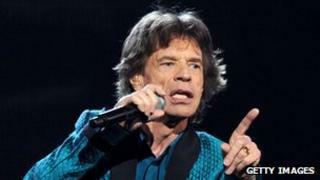 Sir Mick Jagger has returned to the UK singles chart - 27 years after Dancing in the Street, his number one duet with David Bowie. The Rolling Stone star features on the new will.i.am single T.H.E. (The Hardest Ever), which entered the chart at number three. Gotye's Somebody that I Used to Know knocked David Guetta's Titanium off the number one spot. Sir Paul McCartney's latest LP entered the album chart at number three. Kisses on the Bottom, which features two new tracks and 12 covers, is the former Beatle's first pop album in almost five years. Sir Mick Jagger performs guest vocals alongside Jennifer Lopez on the will.i.am single. "We had a great time recording the track and I'm glad that UK music lovers are liking it," the 68-year-old told the Official Charts Company. Lana Del Ray's Born to Die held on to the top spot on the album chart, with the highest new entry - Maverick Sabre's Lonely are the Brave - coming in at number two. The Official Charts Company predicts next week's chart will be dominated by Whitney Houston after the singer died suddenly at the weekend. First verified sales reports will be available on Tuesday.